A year ago, when I was new to Plucky yarn and not nearly as committed to swatching for gauge as I am now, I fell in love with a simple pattern for fingerless knits, Tincanknits Paddle Mitts. They are rustic and adorable and I needed a pair immediately. Although the pattern was written at a DK weight, there were numerous projects in Plucky worsted weight yarns, which made sense as I had slowly been deciphering Plucky's custom milled yarns and realized that their worsted weights were much closer to DK or even sport. So I cast on, using some gorgeous Plucky Scholar I had on hand. It's a quick little pattern, and shortly thereafter, I realized that instead of the cute, rustic little mitt I was anticipating, I had knit a gargantuan, bloated thing. Scholar, it turned out, was the exception to the Plucky rule, knitting up much closer to a true worsted weight and leaving me with a behemoth too large for even my darling husband's paws. It took a surprisingly long time, but I decided the time had come this week, so before frogging Gargantua, I using my "gauge swatch" for complete measurement, and determined I need to knit the toddler size in width but the adult small in length. Like all Tincanknits patterns (her Antler Cardigan is another of my all time favorites), this simple pattern is so well-written and straightforward that it is very simple for even the math-challenged, like me, to make the necessary modification and knit a mitt to fit. I'm actually further along than pictured — the first mitt is complete and I'm waiting for the reskeined yarn from Gargantua, which required a bath to get the kinks out, to dry so that I can knit up its mate. I always wonder why I wait so long in situations like this. 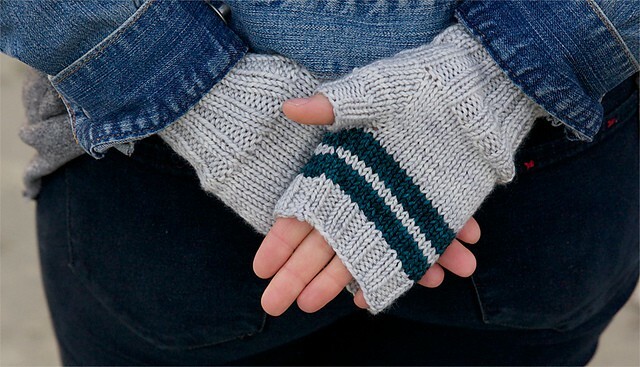 These mitts are adorable and every bit as wonderful as I imagined when I first saw the pattern. I'm so happy to have these in the works at last!